I love to repurpose stuff. I keep old clothing to make something out of them later. I cut t-shirts into t-shirt yarn and sew bags from old jeans. I make sock monsters from socks. My sister sometimes sends me a package full of old clothes and other stuff, and one time I found an old pair of kid’s gloves in there. Hmmm….I made a pair of bunnies. The cuff was cut in half and sewn into legs. The two middle fingers (or rather the middle finger and the ring finger) were cut out and made into arms. The place where they were was sewn shut to make the top of the head. The thumb was cut out and shortened to be the tail. That was it. Then the bunny was stuffed and buttons were sewn for eyes and a cross for a nose/mouth. Well, the bunnies were ok but a bit boring, to be honest. I left them for a while, until I suddenly thought that the bunnies need some winter gear. 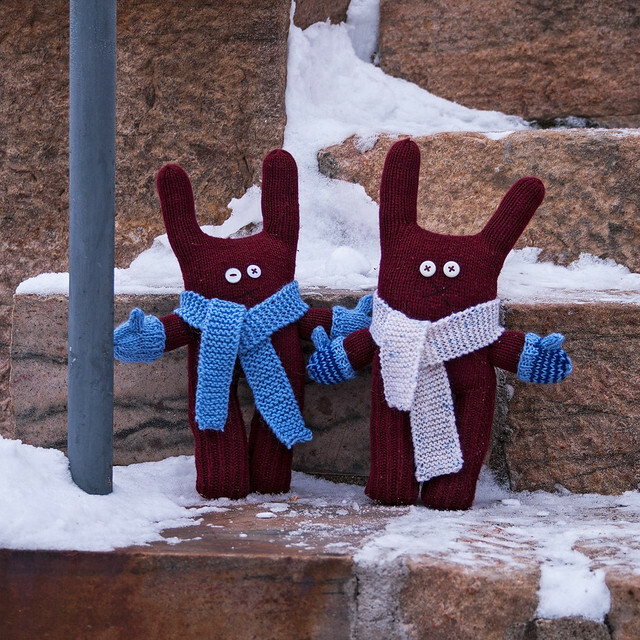 I knitted scarves and mittens for them and now they look a lot nicer.